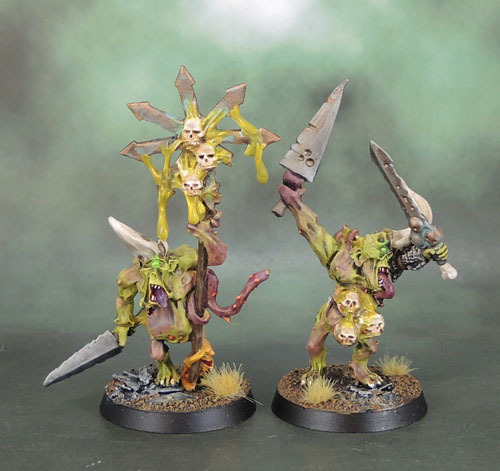 Realm of Chaos – Nurgle’s Children 2018 #9: 3rd Wave Plaguebearers (Again!) 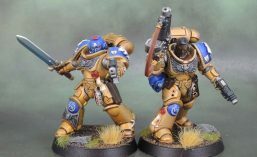 (2001) 3rd Wave Plaguebearer Command (2007). #Squaduary Painting Challenge Success. #Fembruary Painting Challenge Success. | Azazel's Bitz Box. 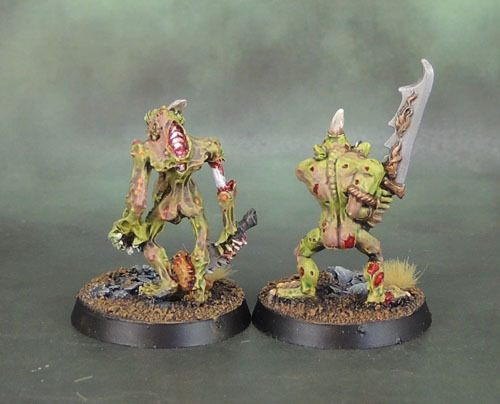 This entry was posted in 40k, Age of Sigmar, Nurgle's Legions, Realm of Chaos, Warhammer Fantasy - 9th Age and tagged 40k, Fembruary Challenge, Lost and the Damned, Nurgle Daemons, Realm of Chaos, Squaduary 2018, Warhammer 40000, WHFB. Bookmark the permalink. Wow, you certainly went to town on Nurgle! As usual, very well done and glad you put the metal first! Cheers Mark. That’s the plan with these guys. The metal’s been waiting a lot longer after all, so it’s only fair to give it preferential treatment in the queue. Awesome mate – even more so when they are in a huge mob! Excellent skin tones. very smooth blendign and a nice sickly touch. Thanks! I’ll be trying some new variations with my next Nurgle guys. Sorry – didn’t see this (or the above comment) until just now. The dull metal on these is really simple to do. I just use a flat coat of Vallejo Plate Mail Metal Surface Primer over (usually) black undercoat with a brush (not drybrushed.) Sometimes/often I’ll give it a light drybrush with Army Painter Plate Mail Metal, then once it’s completely dry just give it a wash/glaze with Army Painter Dark Tone. Some of the Nurgle Swords will have a 1:1 mix of Dark Tone (black) and Strong Tone (dark brown). I find it creates a nice, flat metal look. Depending on what I’m painting, I’ll sometimes do the sharpened edge with Vallejo Model Air Chrome before washing, and when I do wash them I’m careful to wick away too much excess with a brush to avoid puddling.